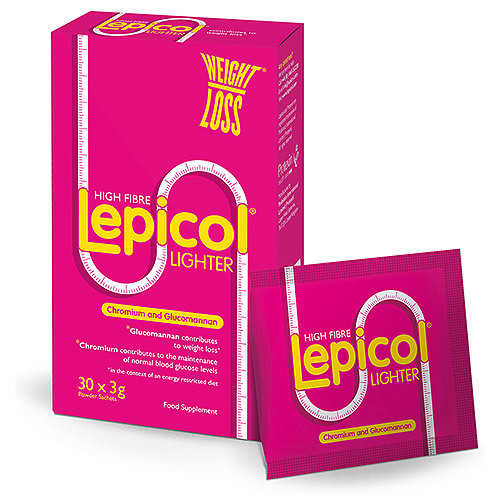 Lepicol Lighter is a high fibre product to help with weight loss and contains 7 strains of live bacteria, chromium, glucomannan and psyllium husk. Glucomannan in the context of an energy restricted diet contributes to weight loss. The beneficial effect is obtained with a daily intake of 3g of glucomannan - a minimum of 1g is found within each sachet, taken 3 times daily with 1-2 glasses of liquid 10 minutes before meals. Chromium contributes to the maintenance of normal blood glucose levels. Psyllium husk contributes to maintaining normal bowel transit. Konjac glucomannan, psyllium husk (plantago ovata), live bacteria (see below), chromium picolinate, Lactobacillus casei PXN 37, Lactobacillus rhamnosus PXN 54, Lactobacillus acidophilus PXN 35, Lactobacillus bulgaricus PXN 39, Streptococcus thermophilus PXN 66, Bifidobacterium breve PXN 25, Bifidobacterium longum PXN 30. Adults: Take 1 sachet mixed with 1-2 glasses of water or juice 10 minutes before a meal 3 times a day, or as recommended by your doctor or healthcare practitioner. Children: Parents should seek the guidance of a medical practitioner before giving Lepicol Lighter to children. Pregnancy and Breastfeeding: We suggest consulting your doctor or healthcare practitioner before taking any food supplement. Please note: Taking Lepicol Lighter without water could cause choking. The beneficial effect is obtained with a daily intake of 3g of glucomannan, in three doses of 1g each - each sachet contains a minimum of 1g of glucomannan. Store in a cool, dry place out of the reach of young children. Below are reviews of Lepicol Lighter - Weight Loss - 30 x 3g Sachets by bodykind customers. If you have tried this product we'd love to hear what you think so please leave a review.